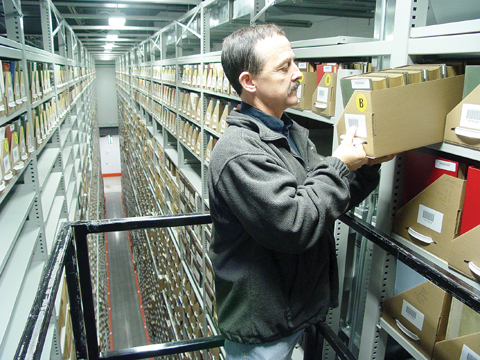 TALL ORDER - Gary Dolan looks for a book 30 feet in the air at the Library Depository/Retrieval Facility on East Campus. A specialized, 8,500 pound order picker allows workers to traverse the towering aisles of books, retrieving them for sorting, interlibrary loans and photo copy requests. Photo by Troy Fedderson/University Communications. The new UNL library depository/retrieval facility is a bookworm's ultimate fantasy. The fourth annual UNL "report card," shows the university met and exceeded several goals on student diversity and quality while increasing research funding. A series of e-mails directed at UNL inboxes have sounded an alert from the University of Nebraska Federal Credit Union. Faculty, staff and students came early, flowed in over lunch and by mid-afternoon on Dec. 11, nurses at the University Health Center gave the last of 500 influenza vaccinations. Jack Dunn sat down at his desk with more excitement than most kids have on Christmas. Artwork from four professionals and eight UNL graduate students will confront a series of difficult subjects as "Culture and Context: Difficult Subjects," opens Dec. 8 at the Robert Hillestad Textiles Gallery. The UNL Clay Club will hold a biannual pottery sale Dec. 9-10 in Richards Hall, room 118. Two senior textile and apparel design majors in the College of Education and Human Sciences will show their collections Dec. 10 in a runway exhibition titled "Solstice: The Senior Collections of Kendra Benson and Abby Woodring." The Sheldon Memorial Art Gallery will be open for holiday hours, noon to 5 p.m. Dec. 27-30. Due to popular demand "Capote" and "Christmas in the Clouds" have been held over through Dec. 22 at the Mary Riepma Ross Media Arts Center. A colorful Nebraska artist is chronicled in the locally produced documentary, "Sleep Under the Sea: John Robert Weaver American Artist," premiering 7:30 p.m. Dec. 9 at the Mary Riepma Ross Media Arts Center. In this poem by western New Yorker Judith Slater, we're delivered to a location infamous for brewing American stories - a bar. Like the stories of John Henry, Paul Bunyan, or the crane operator in this poem, tales of work can be extraordinary, heroic and, if they are sad, sometimes leavened by a little light.